A two-member special court bench took up the high treason case against former military dictator retired Gen Pervez Musharraf on Monday. Musharraf's attorney, Akhtar Shah, told the bench that his client wants to appear before the court in the high treason case but wants assurances that he would be given presidential security. Musharraf is facing the high treason case for suspending the Constitution on Nov 3, 2007 — an offence for which he was indicted by the special court on March 31, 2014. That same year, the state prosecution laid down all its evidence but the progress in the case still slowed down due to the former military ruler having filed multiple petitions against his trial at the appellate forum. In March 2016, he left the country for Dubai to "seek medical treatment" and hasn't returned since. During Monday's hearing, Shah told the Justice Yawar Ali-led two-member bench of the special court that his client would return and "appear before the court if he is given presidential level security by the defence ministry". 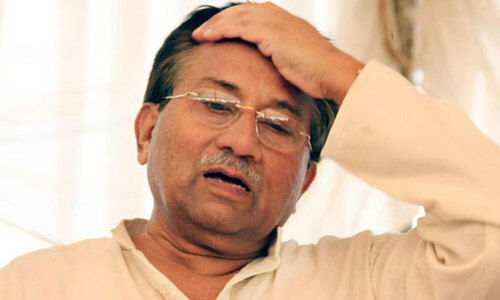 "Musharraf's life is in danger," he added. "There were two attempts on his life: once in the Islamabad court and the other in Quetta during the Akbar Bugti case hearing." At this, Justice Nazar Akbar said: "There is a non-bailable warrant out against Musharraf, so to provide him security is the government's responsibility." Regarding the federal government's request to wrap up the case quickly, Justice Yawar observed: "It is necessary to record Musharraf's [under Section 342 of the Criminal Procedure Code] statement." 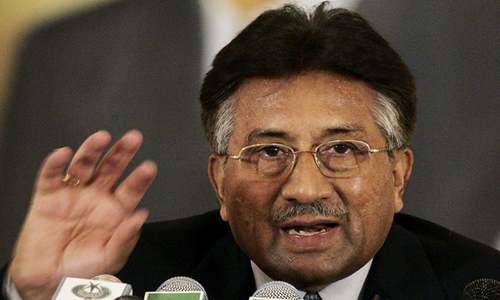 The prosecution reminded the court that Musharraf has failed to appear before the court despite repeated summons. At this, Justice Yawar noted: "What we have to see is that whether a trial can be held in Musharraf's absence. And the question is that can the absconder's counsel appear in the court." In July 2018, the case had suffered a blow when head of the prosecution Mohammad Akram Sheikh, whom the PML-N government had appointed, tendered his resignation citing an "imminent change of government at the Centre". 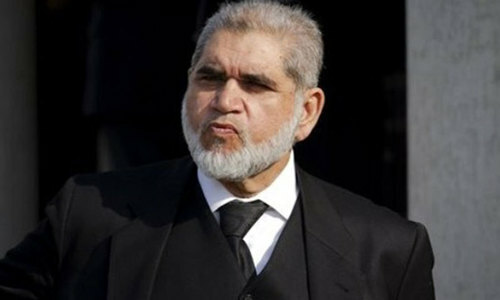 The court today expressed its displeasure at Sheikh's behaviour, with Justice Yawar saying: "If Akram Sheikh wanted to leave the case, then why didn't he submit an application? He is a senior lawyer; he should have known better." The court adjourned the case until August 27 and said that it will hear "arguments on the legal side of statements made as per Section 342". Section 342 relates to the "power to examine the accused". Now only austerity, austerity, austerity. Come and face the music. We must move on and not spend energies and resources trying to revive the split milk. Otherwise, we must start the treason cases against all previous military dictators as well, living or dead, so as to keep the record straight. Why not remain safe and sound wherever you are, and let the country lesser unsafe made under your rule? Why is the self-styled commando so much affraid to return to his country he once ruled as a self-appointed Chief Executive and President? General (r) Pervez Musharraf seems a coward person. Karma catches up with us all, even so called commandos. Mr Musharraf is an honest person and now the team lead by the Captain PM is mostly groomed under Local government introduced by Mr Musharraf.Instead of diverting our energies towards non issues, we must focus on eradicating corrupt practices and recovering looted money. he should come back as the president. Most of his cabinet members are in the present cabinet. 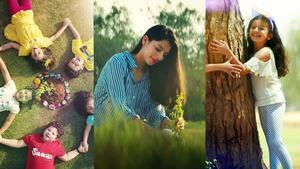 This shows that NAWAZ SHARIF and his daughter MARYAM NAWAZ are more brave and courageous than Parvez Musharraf. Every time a new excuse? Believe me nothing will happen to him. He doesn't need to return and he won't. After a couple of years everything will be forgotten and case will be freezed. He is a coward not cammado!! Govt is duty bound to provide adequate security to Musharraf. @M. Saeed : Absolutely correct, we should not waste our time for such cases, which was fabricated by Nawaz Sharif to take revenge. @M. Emad I guess you are in a position to pass such a judgement - if so how many times did you put your life on the line for the country? And we thought you were commando?? This country has always made a mockery of its democracy and judicial system. All kinds of trivial ,malicious and politically motivated cases are registered to silence those who have something to contribute to the society. Musharraf had made mistakes and we all do under compelling circumstances driven by external pressures. The chief being to allow Sharif family to leave Pakistan and negotiating NRO. But he also worked hard for this country whilst serving the nation in the army and running the country. He should not be treated like a criminal and all these cases must be dropped by the new government even though they may find this difficult to do. This is the country where is possible to ask things of your own choice specially when you have gained a position on behalf of money and fame. Law has no importance in such cases. Can a common man ever say to any court, I can not appear because I am busy in my personal work or I do no feel safe or comfortable at all. Wow, what are the facilities and blessings attached with certain positions. @Babu However, he should stay where he is and not stir the pot again. PK needs time to breathe under the new regime. Ground is cleared, he can come now . Musharraf during his tenure survived a few attempted attacks on his life,without presidential security,he should not set foot in Pakistan,the most knowledgeable Pakistan leader. culprits, looters, etc of PPP and PML-N. He was/is for the betterment of Pakistan. All of you insulting him should be ashamed, if you are so brave then join army and defend country on battlefield!! The vindictive charges against him were made by Nawaz Sharif the worlds biggest dacoit who filled his familys pockets while Pakistan starved. There are enough PMLN sponsored terrorists in Pak to murder Musharraf now that he is a civilian, he is not a coward, he knows how dishonorable our own people can be for a few rupees.